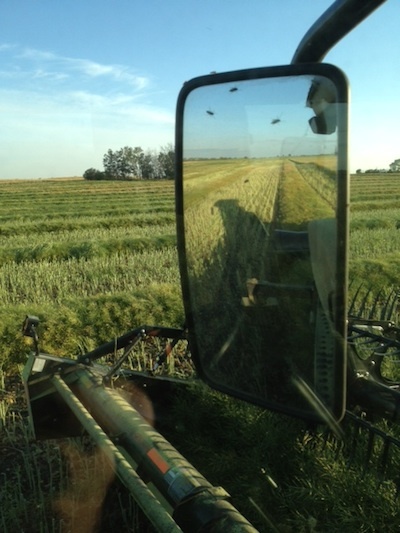 Swathing will likely start within a week or 2 for earliest canola fields. Keep in mind that the ideal time to swath is around 60% seed colour change (SCC). Some fields will have to be cut earlier for growers with a lot of canola to get down, but try to avoid cutting before 30% SCC. See this week’s top 10 list for diseases to look for ahead of swathing. The days leading up to swathing are an excellent time to identify diseases present. Once diseases are identified, growers can augment management practices to reduce specific diseases in subsequent years. Insect monitoring continues this week, with diamondback moth larvae, bertha armyworms and grasshoppers the most important. Diamondback moth larvae are showing up in canola fields. 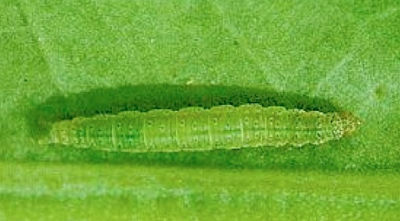 The most accurate method to estimate diamondback moth population density is to count larvae in several locations throughout the field, and determine the average population per unit area. 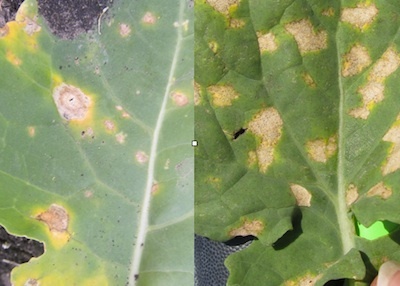 Swede midge damage has been confirmed in canola fields in northeast Saskatchewan. 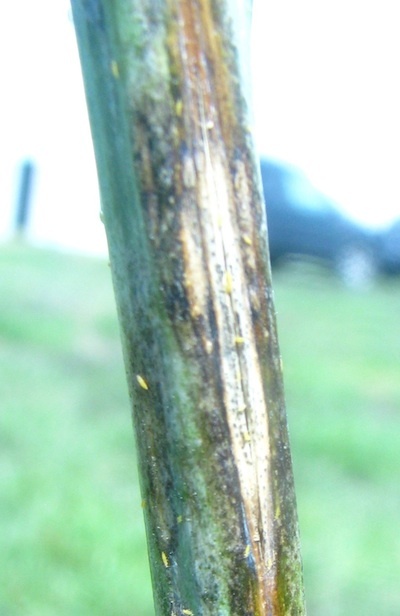 The insect is not a major threat to canola in Western Canada, but it often causes extensive damage in Ontario. Entomologists want to keep on top of the insect in Western Canada, and would be interested to hear from you if you spot potential Swede midge damage. Delaying swathing while you wait for more plants to mature is generally positive for yield, especially at this stage of the season. 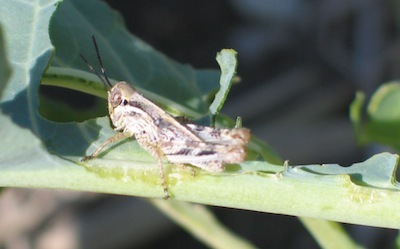 Insect scouting is the top priority as canola moves out of flowering and into podding. 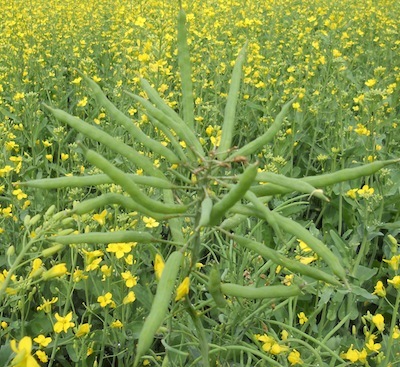 Protection from insects, using economic thresholds, is most important at this stage as canola no longer has the capacity to compensate for losses. 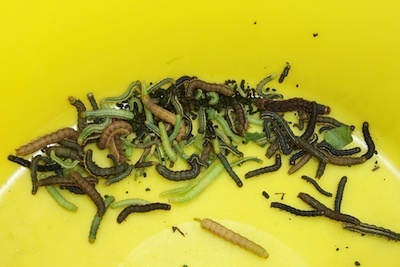 The photo above shows the various colours of bertha armyworm. 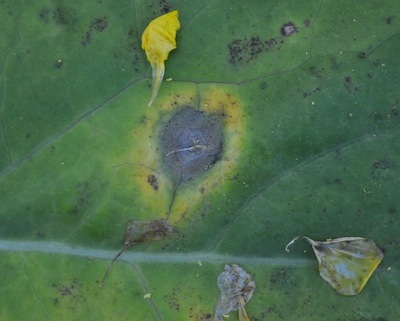 While scouting for insects, take a look at plants for early signs of blackleg, clubroot and sclerotinia stem rot. Nothing can be done to mitigate losses at this stage, but identifying which diseases are present is relatively easy between now and harvest. Scouting now provides the opportunity — if diseases are present — to modify management plans in subsequent years. If you start to see problems show up, be wary of product claims such as, “If you had sprayed our product in June you wouldn’t be seeing that right now.” Get a few opinions, if necessary, to accurately identify problems. Try the Canola Diagnostic Tool at www.canoladiagnostictool.ca. Keep notes. And prepare to use proven remedies next year. A few noteworthy events are coming up: Disease Scouting Clinic in Portage la Prairie, Manitoba July 30; Crop Diagnostic School in Indian Head, Saskatchewan July 30-31; and the Clubroot Galla in Brooks, Alberta July 31-August 1. 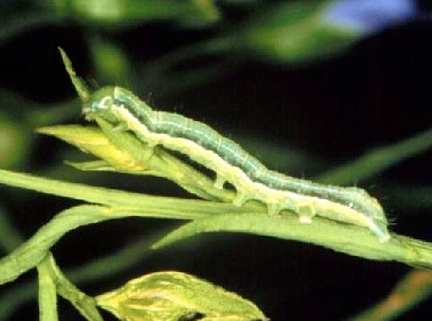 You find bertha armyworms at economic thresholds and you plan to spray. Before spraying, you need to estimate how many days it will be before you cut the crop. Why? 3. Record what you find. With detailed records, including insects found in each field, insect numbers, what they’re feeding on, time of day, temperature and weather conditions, you know which fields to scout more frequently, and you have comparison points for other fields and other years. 2. Follow thresholds. Every major insect of pest of canola has an economic control threshold. See the table below. 1. Pre-harvest intervals. If spraying is necessary, choose a product with a pre-harvest interval that fits within the timeframe between spraying and cutting the crop. Thrips damage shows up in some fields. Bertha armyworms are the bigger issue, with adult counts continuing to build and many areas now at moderate risk, or higher. Read more to see links to latest maps and counts. 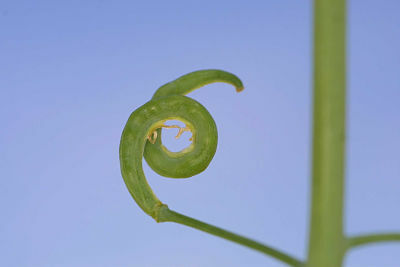 The window to control disease in canola is closed, so why scout? Well, because the period from podding to harvest is the easiest time to see diseases. And if you can identify which diseases are present, you can adjust your variety choice, crop rotation and fungicide use for subsequent years. 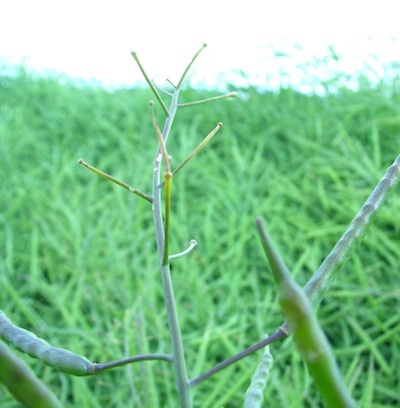 The pod stage is the critical time to watch for insect feeding in canola. When flowering is done, the crop cannot produce more flowers to compensate for insect losses. 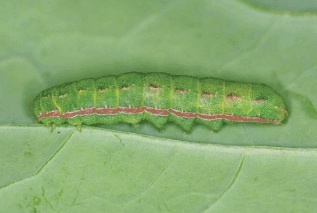 Thresholds for insects such as bertha armyworm, diamondback moth larvae (shown in the photo above) and lygus bugs are based on losses at pod feeding. However, take care with timing. Jumping the gun with early insecticide applications on flowering canola can create a whole lot of trouble for beneficials, have limited benefit in terms of insect management, and be a step back in sustainability. With a healthy beneficial population, insect outbreaks are never as severe as they will be without the beneficials to keep populations in check. 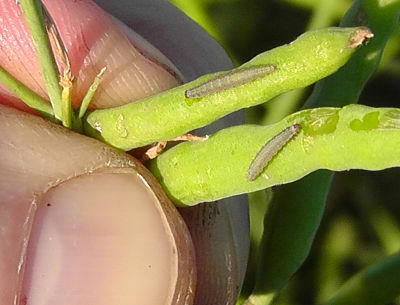 Adding insecticide to a fungicide mix may “only” cost $5 per acre, but the timing is not right for insect management — other than for cabbage seedpod weevil if at thresholds. There are likely many other better ways to spend that money — including waiting until early pod stages to spray. If finding time to scout is an issue, consider spending part of the $5 per acre to hire someone to scout for you.